A bunion is a painful lump that can develop on the side of your foot and affect how you walk. Wearing ill-fitting shoes can contribute to bunions forming because they put a strain on the bones and muscles in your feet. Bunions are the most common forefoot problem in adults and are much more common in women than men. The first sign that a bunion is developing is when your big toe starts to angle towards your second toe. Doctors may use the medical term ‘hallux valgus’ to describe the turning of your big toe combined with a bunion. ‘Hallux’ means your big toe. ‘Valgus’ means that it’s pointing towards the other toes on that foot. Your big toe may also turn so that the toenail is facing your other foot, rather than upwards. As your big toe bends towards the other toes, the bone at its base gets pushed out to the side. It then sticks out and rubs on your shoe. These symptoms can make it difficult to walk and lead to pain in the ball of your foot. You might also find that your shoes don’t fit properly. Sometimes, the skin over the bunion can become red, blistered or infected because it has been rubbing against your shoe. A fluid-filled space called a bursa may also develop under your skin. This can be painful if it swells up (bursitis). These symptoms may be caused by problems other than bunions. If you have any of them, make an appointment to see a podiatrist or chiropodist. These are healthcare professionals who specialise in conditions that affect the feet. The term ‘chiropodist’ isn’t widely used anymore. Your GP may be able to refer you to a podiatrist or you can see one privately. See our FAQ on podiatrists below for more information. Your podiatrist will diagnose your bunion by asking about your symptoms. They’ll also examine your feet and may ask you to walk around so they can see how the bunion affects the way you walk. You may have blood tests to rule out other medical conditions such as rheumatoid arthritis or gout. If you have a bunion, one of the most important things you can do is to wear the right footwear. Try to resist any temptation to wear high heels because they can make a bunion worse. High heels push your foot forwards in your shoe and shoes that are too narrow in the front squeeze your toes together. Choose shoes with a heel less than two inches (five centimetres) high and wide enough at the front not to cramp your toes. It’s very important that your shoes fit properly. It might help to put a bunion pad over the area to give it some protection from the pressure of your shoes. You can usually buy these pads from a pharmacy or get them from your podiatrist. Your podiatrist may also recommend a shoe insert, which can be moulded specifically to your foot. If your bunion is painful and swollen, you might find it helps to put ice on it – a bag of frozen peas works fine. Take care not to put any ice directly onto your skin because ice can damage your skin – so wrap whatever you use in a towel. Wearing appropriate shoes, using shoe inserts (orthoses or orthotics) and padding, and taking painkillers may help to ease the symptoms of a bunion. But they won’t always stop your bunion from getting worse. If you have severe pain from a bunion, you might need to have an operation to correct it. You can take over-the-counter medicines, such as paracetamol or ibuprofen, to help relieve pain and swelling from a bunion. Always read the patient information leaflet that comes with your medicine and if you have any questions, ask your pharmacist for advice. If you have a bunion caused by arthritis, your GP may prescribe medicines to treat this. For example, your GP may recommend you have a steroid injection into your toe joint. This may also be an option if you don’t have arthritis but have severe pain from a bunion. If you want to have surgery because of how your bunion looks, you’ll need to have this done privately. However, surgery is not recommended solely for cosmetic reasons because there can be complications. Surgery to correct a bunion is called a bunionectomy. There are many different types of this operation. The simplest just removes the bit of bone that is sticking out. More complicated operations aim to correct the alignment of your big toe. This narrows your foot and straightens out your big toe joint as much as possible. An operation won’t return your foot to normal but most people find it reduces their symptoms and improves the shape of their foot. It’s important to make sure you wear sensible shoes even after your operation. The type of operation you have will depend on how severe your bunion is and whether or not you have arthritis. You can read more about bunion surgery, including information on how long it takes to recover and when you can walk again. Doctors don’t know exactly what causes bunions, but things that can increase your risk of developing them include the following. The way you walk, for example if your foot rolls inwards. Over time, this can lead to a bunion forming. Bunions can run in families, but just because your parents or grandparents have bunions doesn’t mean you’ll necessarily develop them too. The type of shoes you wear may affect whether or not you get a bunion. Narrow or high-heeled shoes can put extra strain on the bones and muscles in your foot and push your toes together. Wearing poorly fitting shoes doesn’t cause bunions on its own but it can make them worse. You’re much more likely to get bunions if you’re a woman. This may be from wearing tighter footwear and high heels, or because the ligaments in your feet (the structures that connect bones together) are looser in women. Bunions are sometimes associated with conditions that affect your joints, such as rheumatoid arthritis. Other health conditions that are associated with bunions include gout, stroke or a foot injury. They may also suggest you use shoe inserts (orthotics or orthoses) to correct your walking if you have problems. Will a bunion cause osteoarthritis in my big toe? Will a bunion cause osteoarthritis in my big toe? Not everyone with a bunion develops osteoarthritis. However, any movement of your big toe inwards may mean you’re more at risk of developing the condition. Osteoarthritis in your big toe, can develop in some people who have bunions. It can also happen the other way around – if you have osteoarthritis in your toe, it can lead to a bunion developing. Your toe joint is more prone to osteoarthritis than any other joint in your foot. This is because of the repeated pressure you put on it when you walk. Osteoarthritis is a condition that affects your joints and makes them stiff and painful. It causes the cartilage on the end of your bones to get rougher and thinner. The bone beneath reacts by thickening and growing outwards, and can create bony outgrowths called spurs. These make your joint look misshapen and knobbly. What is a podiatrist and how can I find one? What is a podiatrist and how can I find one? A podiatrist is a health professional who treats conditions that affect your feet. They are sometimes called chiropodists – podiatrist and chiropodist mean the same thing, but the term ‘chiropodist’ is less frequently used nowadays. A podiatrist is trained to treat people with health conditions like arthritis and diabetes, as well as sports injuries. Podiatrists can also diagnose and treat conditions such as ingrown toenails, corns and calluses, and infections including Athlete’s foot and verrucas. They can give advice on how to take care of your feet and recommend exercises, devices and shoe alterations that may help relieve your symptoms. There are a number of ways you can get in touch with a podiatrist. Your GP may be able to recommend someone or you can contact the College of Podiatry. This institution represents practising podiatrists. It’s important to find a podiatrist or chiropodist who is a member of the Health and Care Professions Council (HCPC). This will ensure that you see a registered professional. How long until I can walk after bunion surgery? How long until I can walk after bunion surgery? The time it takes to recover from bunion surgery will depend on the type of operation you have had. You may have to wear a plaster cast, a brace or a protective shoe after some types of operation. With some operations, you can walk on your affected foot immediately. With others, you need to keep weight off your foot for up to eight weeks. You can use crutches during this time. It usually takes three to six months to recover fully, but this will vary. One person may feel no pain and recover very quickly, whereas another may be in discomfort and take a long time to heal. It depends on your individual circumstances. With some types of surgery, you may have to wear surgical shoes for six months to allow your bones to fully heal. When you can return to work will also depend on the type of operation you have had. Another important thing to think about is how much time you spend on your feet doing your job. If you have a sedentary job, you may need to take up to six weeks off work. If your job is very physical, you might need up to three months off. Your surgeon can give you more advice about this. Can I get a bunion on my little toe? Can I get a bunion on my little toe? Yes, although these are less common than bunions of the big toe. If a bunion forms on the outside of your foot, below your little toe, it’s known as a bunionette or a tailor’s bunion. 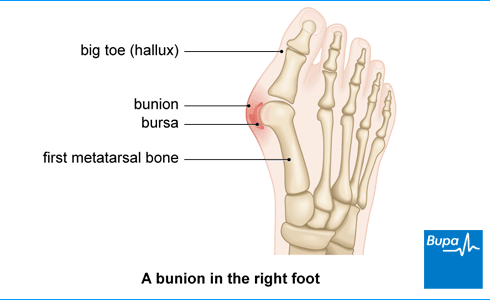 A bunionette can be treated in the same way as a bunion of the big toe. If you have a bunion at the base of your little toe which is causing you discomfort or pain, there are some things you can try to ease your symptoms. Try taking over-the-counter painkillers like paracetamol or ibuprofen, wearing suitable shoes, or using bunion pads. If your symptoms don’t get any better, you may need to be considered for surgery, so make an appointment to see your GP or a podiatrist. Bunion surgery is an operation to remove or realign the bone that sticks out on your big toe when you have a bunion. A condition that causes sudden swelling and severe pain in your joints.